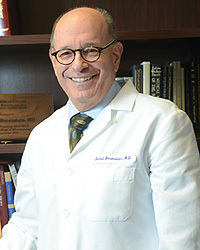 Dr. Borenstein is a Clinical Professor of Medicine, Division of Rheumatology at The George Washington University Medical Center in Washington, DC. He is Board Certified in Internal Medicine and Rheumatology and is a Fellow of the American College of Physicians and the American College of Rheumatology. He is a member of the 250 physician International Society for the Study of the Lumbar Spine and of the Rheumatology Society of the District of Columbia. Dr. Borenstein is the author of Low Back Pain: Medical Diagnosis and Comprehensive Management, and Neck Pain: Medical Diagnosis and Comprehensive Management, both textbooks for physicians. His book, Back in Control!! A Conventional and Complementary Prescription For Eliminating Back Pain was released in June 2001 and is written for the lay population as his book Heal Your Back: Your Complete Prescription for Preventing, Treating and Eliminating Back Pain which was released in January 2011. His primary clinical interests are low back pain, neck pain, spinal disorders, and osteoarthritis. Dr. Borenstein has earned the recognition and praise of the medical community by being named as an outstanding specialist in Rheumatology in Washingtonian magazine, Washington Consumers’ Checkbook, Who’s Who in Medicine and Health and Best Doctors in America. He is currently serving as the President of the American College of Rheumatology and is the 2011 recipient of the Marriott Lifetime Achievement Award which was bestowed upon him for his outstanding accomplishments and lifetime achievements in the field of rheumatology. Dr. Borenstein hosts a weekly online radio show “Speaking of Health with Dr. B” providing listeners with crucial info on health issues and in-depth conversations with experts about the essentials to live longer and healthier lives. Accepting patients at our Washington, D.C. facility. For more information about Dr Borenstein you may visit his website.